← 75. Arbroath. 6 May 2018. Let’s get something clear – Meldrum House is a beautifully crafted parkland golf course cut among the agricultural heartland of Aberdeenshire. The quality and design, by Graham Webster, is of a very high standard. However (yes, there is a big one), in establishing the course as “the exclusive golf experience”, Meldrum House feels so untypically Scottish. 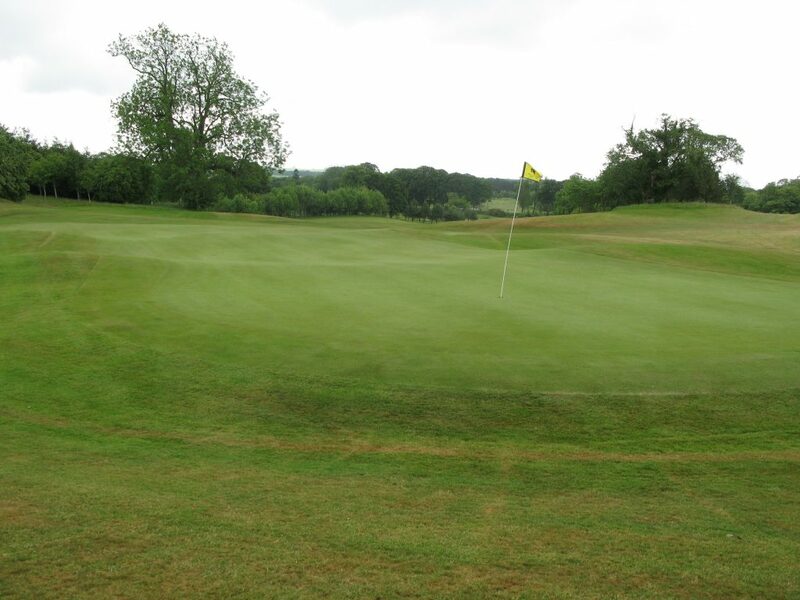 It felt much more like playing, for example, the AA Golf Club in Epsom, than a Scottish golf course. Perhaps that’s why there was a need to stock some Highland Cattle between the 17th fairway and the manufactured lawns of the Country House hotel of the same name, otherwise one might think you were playing the very many lookalike late 1900s courses developed in the southern counties of Surrey or Hampshire. 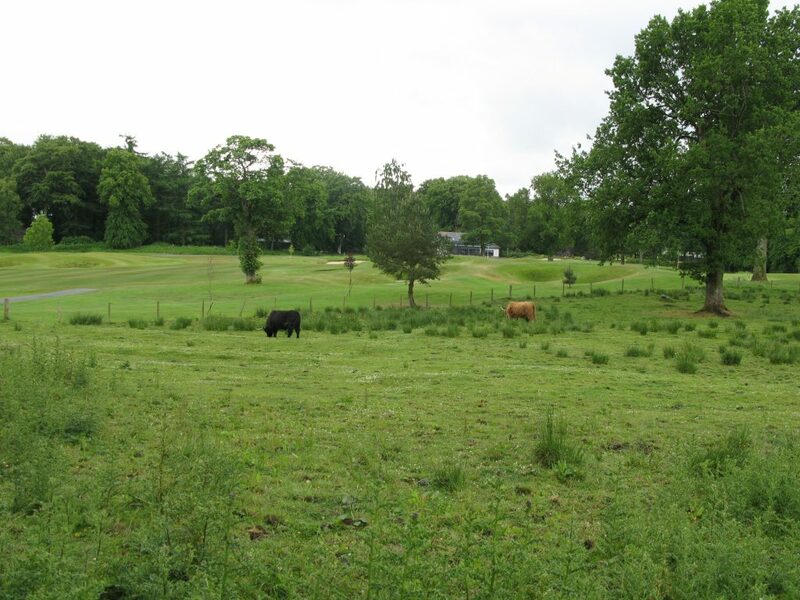 The rare Highland Cattle compliment the surroundings at Meldrum House – 17th hole behind. The only way to play a single round is to stay at the 4-star Meldrum House hotel, which allows guests to play the course for a fee of £85. Therefore, with dinner, bed and breakfast, a round here is going to cost at least £250+. Hence why I’ve assessed its value rating as 2. Meldrum House hotel provides great accommodation and the estate of the same name has a long heralded history, with the Barony of Meldrum dating back to the 13th Century. So, if you were looking for an Aberdeenshire short break with a bit of golf and good food, it’s a great option. For the record, individual membership (2018 prices) of Meldrum House golf club is £1,895, although for that the club does consider it “our privilege to have our members”. Unsurprisingly, business memberships are available, and start at over £5,000. Of course, there lies the likely clue to the golf course’s existence, which seems to rest on the wealthy oil industry of the North East. I’ll wager that this course will not be around in it’s current format, once the North Sea oil is long gone. Why pay these Meldrum House fees when membership of one of the world’s best courses, Cruden Bay, is £680, and only about 22 miles away? Par 3 10th hole, one of the 7 water feature holes in the first 10 at Meldrum House. 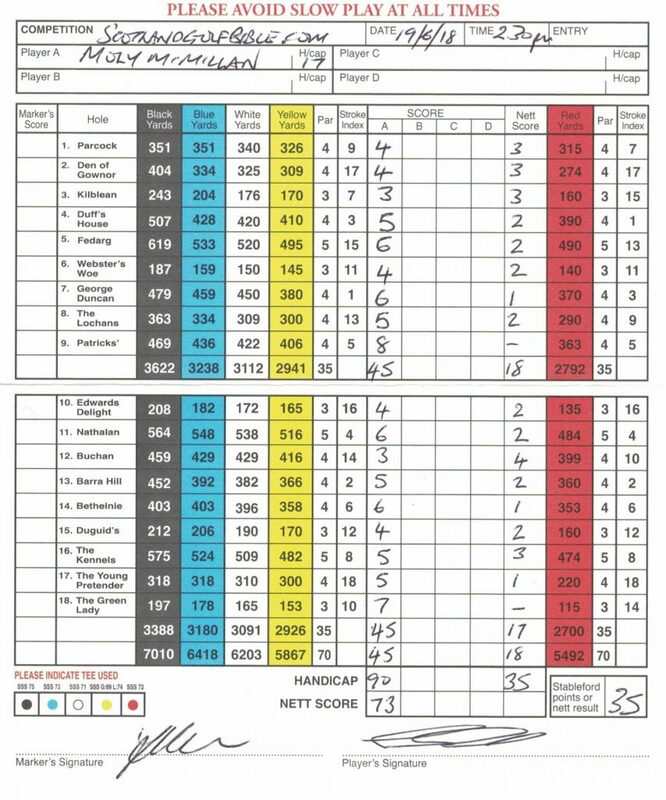 The course has a headline length of over 7000 yards from the black tees, but I suspect most will play from the White (6203) or Yellow (5867) tees, the latter which I used while playing with my wife Fran who used the Red (5492). There is water genuinely in play at 11 of the 18 holes, and at 7 of the first 10. There is also many very deep bunkers. To score well, you need to play strategically around here and pay close attention to the course planner (included in the fee!). I did this pretty well other than at the 8th, the aptly named “The Lochans”, and the 18th (more of later); the 8th fairway slopes left to right towards the water hazard, which I surprisingly found after a well struck drive; the smart play is a hybrid from the tee to the left side of the fairway. The beautiful 16th hole at Meldrum House, characteristic of the course. Holes 11 through 15 play on the higher part of the course, with no water hazards, but the stretch starts with what can be described as a “gimmicky” 11th hole which has a disaster of 15 (yes 15) bunkers in front of the green approach. I couldn’t help wondering what the record is for the most, separate, bunkers ever played from on a single hole?? 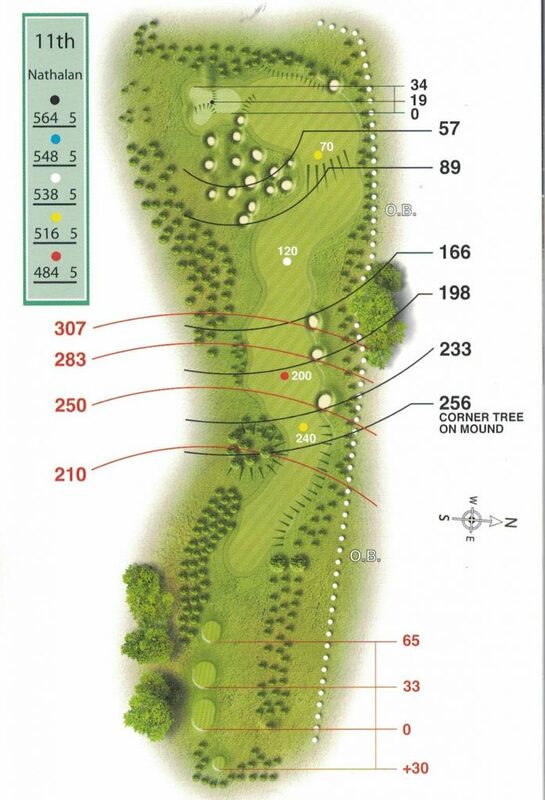 The “gimmicky” long par 5 11th, with bunkers covering 70 yards of the green approach. The course was in very good condition when I played other than one fairway (9th) which was poor. 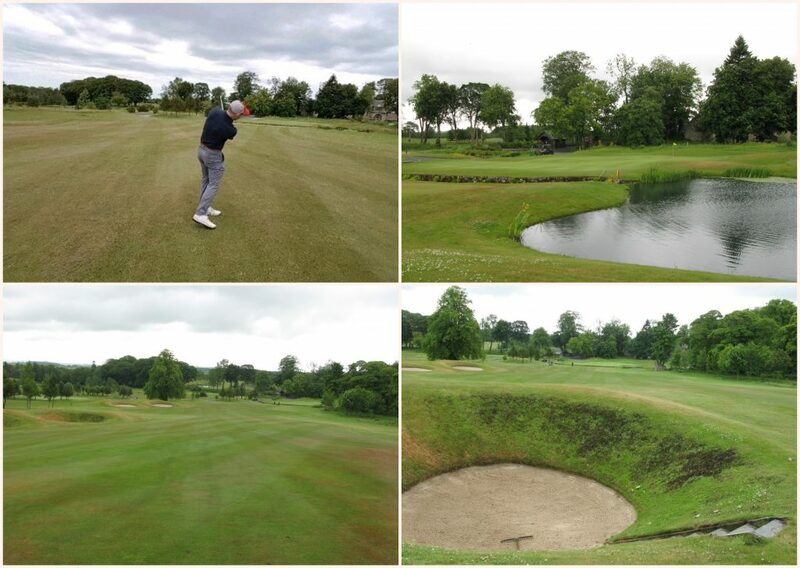 The greens were beautiful, the tees and bunkers well kept and manicured. It was also a very pleasant walk and, of course, there was hardly any other players! The 18th, unusually, was a short to medium iron, par 3, played over 2 sets of marshy water hazards. Unfortunately, I found both hazards for a 7, my second quadruple bogie of the day, along with the 9th, which ruined an otherwise impressive card. I still shot 90 for 35 points. 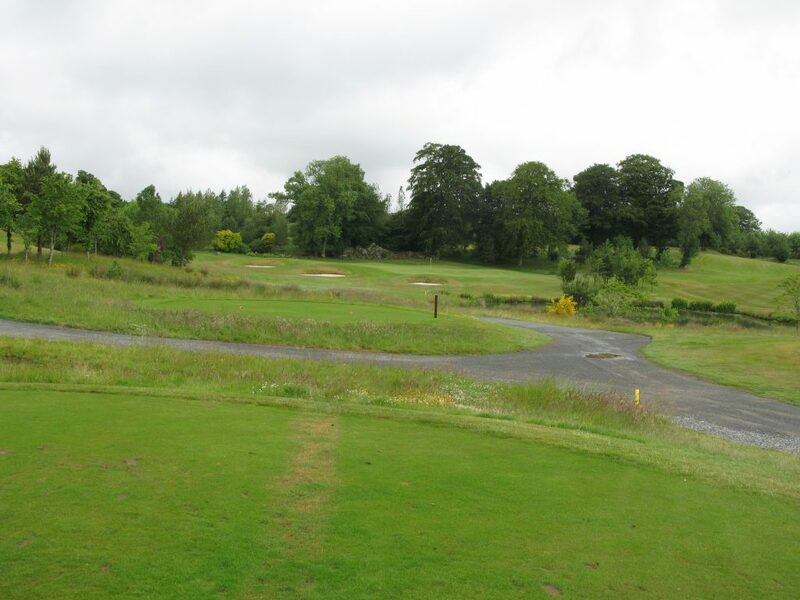 This entry was posted in 18 holes, 1946 - 1999, 2 star, 2.5 star, 4 star, Aberdeen City and Shire, Commercial, Course Architech, Course Owned By, Course Quality, Course Type, Graeme Webster, Holes, Overall Value, Parkland, Price, Region, When Course Established, £80 - £99. Bookmark the permalink.